For centuries, one principle has stood above all others in the medical field: First, do no harm. But has our basic healthcare lost this vital philosophy in its pursuit of advancement and profit? Follow the journey of medicine from its earliest beginnings at the dawn of humanity to the incredible technological advances of the 21st century. 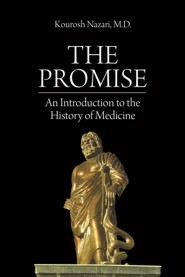 By examining key figures and events, this book’s focus on the rationales of pioneering practitioners and the philosophies behind major discoveries sets it apart from current medical and historical literature for both providers and consumers of healthcare. In the age of unprecedented advancements, the evolution of medicine and its underlying philosophies has been cast aside for the pursuit of the next, best development. In the search to provide the best care, human history has had great triumphs but also great horrors. It is important in our healthcare pursuits, both as patient and practitioner, to remember that history and examine how today’s medicine fits within its historical progression. Dr. Nazari is a practicing physician, medical director at two surgery centers, and a member of faculty at University of Central Florida School of Medicine. He has travelled extensively and practiced medicine in many parts of the world, witnessing the gift and the misery of medicine. His experiences in healthcare administrative tasks and delivering care in developed and developing countries and healthcare administrative tasks give him a unique perspective to bring the story of medicine to the audience and critically appraise the state of medicine in the United States. Dr. Nazari has written three other books: Lessons from East and West, The Great Divide, and The Resurgence, America in the 21st Century.